A reader suggested this chart as we approach U.S. Patent No. 10,000,000. Were you using extended, or INPADOC families here, or simple families? This will make a big difference in the results. A few years ago I found that about 33% of the extended families where the US was the priority country and were there was a WO document in the family had more than one US application number in the extended family (link to patinformatics.com). Frankly, I’m a little surprised the percentage isn’t a little higher considering US practice of leaving cases open for additional prosecutions and claim building. Hey Tony — What I looked at here is really narrow — Looking at US Utility Patents – how many of them claim priority back to a prior US issued patent. That makes sense. I wonder what percentage are divisions versus continuations. My guess would be a significant percentage of continuations. Questions: If more than two-thirds are not divisionals [even voluntary divisionals or only divisionals responsive to PTO restriction actions?] then what are they, respectively? Are they at risk for obviousness-type double patenting attacks based on those prior-issued “family” patents? By “family” do you mean a then-application cited in the priority-claim-chain of the subject patent? If not divisionals, they are continuations and continuations-in-part. About half include a terminal disclaimer. The desirability of having at the USPTO “something pending”, in the time after your patent application goes to issue, is ever more persuasive, is it not? Yes, it was desirable before and is even more so now. If the issued patent is sued on and prior art is asserted against the asserted claims in either the suit itself or an IPR, the pending continuation claims can be amended to hopefully overcome that prior art being requisitely cited in the continuation and non-infringement arguments. To avoid obviousness-type double patenting attacks terminal disclaimers may need to be filed, which will require single ownership but will normally no longer affect patent term if they have the same earliest priority date claim and do not differ in PTO or applicant delay term changes. I had in mind, as an incentive to continue, the increasing prevalence and penetration of post-issue challenges to issued claims at the USPTO. Likewise at the EPO, where post-issue opposition is common. Having something pending is your insurance policy. Besides, it might even deter a party from even filing an opposition. Why do that, only to see the patentee shore up the pending div and render it unassailable. So, one more reason to file an EPO div before your patent issues. But, that said, patent families routinely feature one or two members in each jurisdiction except the USA. There, there might be ten or twenty family members. 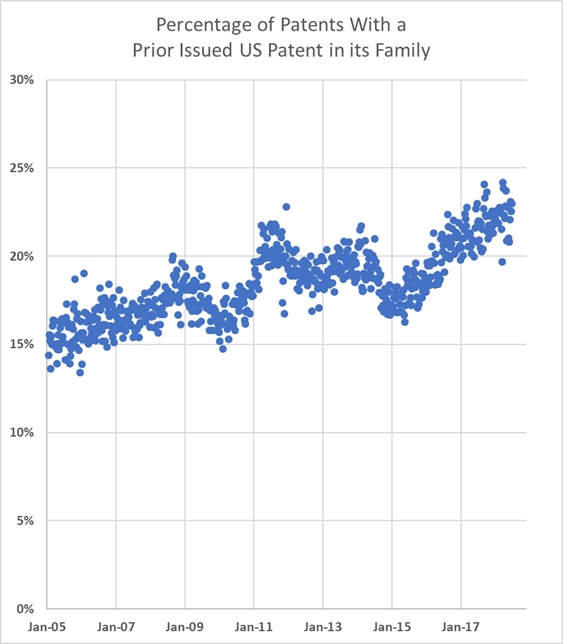 Max, if your observation is typical – of that far more “family members” in U.S. patents as compared to other countries – the reasons should be of interest for discussions here? Clearly one is the far more aggressive [or unreasonable] restriction requirements of some U.S. examiners, some not even being seriously challenged for various reasons, and/or poor PTO petition response timeliness and results. Also, one expects more family members for pharmaceutical patents. But those alone would not cause such a large difference? I agree, and further note that a restriction guarantees a shot at an artificial patent family size increase, since restrictions are to be done only for patentably distinct items (and the restriction itself sets the table for such). and/or poor PTO petition response timeliness and results. Not sure I can agree – how does the p00r petition practice intersect here? Perhaps, a Con is filed after a petition is made (with no resolution of that petition in sight)…? That I can agree with. Cannot agree – why would pharma patents – in and of themselves raise differences in family count between the different sovereigns? PTO restriction objection petition response with poor timeliness and results can impact prosecution when when the restriction petition decision does not occur until after elected species is allowed and must issue or before other prosecution deadlines. No Paul, I did not. You need to follow your own advice and read more carefully. You made the additional statement that “one expects more family members for pharmaceutical patents,” and my point is that this “expectation” is not a driver for difference in family member count, because that SAME “on expects” applies in all sovereigns, and thus would not be a part of ANY difference – your “not” does not apply to such, as there is NO “alone” there and I am pointing out to you that there is NO “alone” on an item that would be the same in each sovereign. The one “being too quick” here is you and your wanting to think that you are (somehow) being unfairly picked on. Continuations, I would say, Paul. What other jurisdiction has them? When I write “family” I include every A publication. I do not confine to issued patents only. On a previous occasion when I pointed out the greater number of family members, I was told this is because Applicants see the US jurisdiction as, uniquely, important enough to justify the cost of growing such a large family. I suspect there is some weight to that answer. How is that done without adding new matter? Or are you only talking about a CIP? Amend or add claims in the continuation with art-distinguishing limitations, to the extent supported by the original specification. CIP practice is dangerous since it loses priority date benefit for any CIP claim containing any of the new matter added to the CIP, and that can make even the published parent prior art as to those claims, depending on when the CIP was filed, and the AIA. At the EPO, how? You can fine tune the scope of the claims pending in the divisional without adding matter, to dance around the opponent’s validity attacks on the issued claims of the div’s parent. You can fix any vulnerability in the pending claims to attacks on its validity under Art 100(c) EPC that the cunning Opponent has formulated, and which have caught you by surprise. Standard “out”? Well yes, of course. What else but an “intermediate generalisation” is an amendment to a claim, performed after the filing date? How often does it happen, that the claim originally filed has to be amended because it turns out to be too wide? Would that be seldom? Occasionally? Quite often? Or very often, anon? No wonder there is some caselaw on the issue of “Improving one’s position after having filed the application is not allowable”. It’s a feature of a “Spoils go to the one who was First to File” patent system, as the USA will gradually come to realise. And with realization, it will dawn on folks that drafting a good set of claims is one of the highest level skills in the patent attorney profession. Heck, it’s the first and most important attorney task in any patent litigation. I not that you have not answered my question. In fact, by deflecting to a truism of “good Claim writing” is important, your reply does not address at all amendments to overcome new and prior unknown (to the drafter) art (had the drafter known, then the claims would not need to be amended, and since unknown, we are necessarily talking about amendments that encompass changes to the original claims – no matter how well drafted. Please try again and address the point presented. You are free to note whatever you like, anon, but I say I did answer your question. You said “Please” and asked ever so nicely so, OK, I’ll “try again”. Yes, of course you and I are focussed on the problem of prior art that emerges after the patent application has been filed, art that was unbeknown to the drafter prior to filing the patent application. That’s what is so challenging about good drafting, of the claims, and of the disclosure that supports them. There has to be a written description good enough to provide useful fall-back positions, ie intermediate generalizations, after filing, when additional prior art emerges for the first time. The prohibition of intermediate generalizations during prosecution is not absolute. Coming down to an intermediate generalization is routine and fully in order. It’s what Applicants are expected to do, isn’t it? Nothing wrong with it at all. What’s not in order is to attempt to come down to an intermediate generalization, an intermediate level of generality, a rung on your “Ladder of Abstraction”, a “selection invention” if you like, that is not derivable from the application as filed. Don’t worry. You are by no means alone in the USA, in finding it difficult to distinguish between disclosed intermediate generalizations and those that are undisclosed in the application as filed. To do so, you need an educated appreciation of what the concept of the “disclosure” of a document means to one who practises under the EPC. $0 years of practice under Art 54(3) EPC, for which one needs a strict separation of the concepts of novelty and obviousness, has cultivated over 40 years our sense of what the “disclosure of a document” really involves. Just as I struggle to develop a feel for what “printed publication” or the “printed matter doctrine” means under the patent law of the USA, so patent attorneys outside Europe lack a refined “feel” for what “disclosure” means under the EPC. It is what it is. Simple as that. Thank you for trying again (no snark). I still think that you are not answering MY question. I think that you are answering a question, but that question that you are answering is not my question. One reason why I think this is that you are still setting the table with verbiage that is just not on point. **As an aside, and perhaps to generate a separate conversation, there are two points buried in your statement that deserve clarification. **The first statement deals with the use of the word “emerges.” As I have distinguished previously for our sovereign, whether or not something “emerges” for the real life person of an actual inventor is NOT the test for the legal concept of obviousness and the NON-real life person by which obviousness is determined. That NON-real life person (the legal fiction of PHOSITA) is not concerned with the REAL LIFE effect of “emerges.” That legal fiction IS concerned with the actual state of the art, and that state of the art is reflected even in the “secret prior art.” I DO recognize that the ROW (EPO) version is much more concerned with a real life inventor, but I hope that you realize that such is actually a muddying of the NON-real life person and the real life person for the legal notion of obviousness. I respect the choice of the various sovereigns to treat this as they have chosen, but objectively, the US version is actually a more consistent position. **Likewise, the second statement deals with the phrase “art that was unbeknown to the drafter prior to filing.” For the same reason that obviousness is NOT determined in view of any real life drafter, the phrasing – as you do here – of TWICE relying on aspects of a real life person is part and parcel of the problems that engender from your comments. The problem being that you seem blithely unaware of that difference – and why there is a difference. **But as I stated: this problem of yours is a separate problem and is not related to my question. Further, and to my question, I do not think that you are answering it because you again parrot a mechanism that fails to address MY question. That is, writing a good application with useful fall-back positions, and those positions appropriately captured in the as-filed application are NOT what befalls your past criticisms of “intermediate generalizations.” As such, you volunteering that aspect as if it were an answer to MY question is a non-sequitur at best, and an obfuscation at worst. Such drafting would be a starting point – a given – in BOTH US and EPO situations. I state this as well as because in past conversations, I have provided that there exists in US situations a rather standard (almost boilerplate) technique that provides for a much more robust and full spectrum of generalizations from the very top of the claimed ladder all the way down to the bottom rung of that ladder. Such is nearly a de facto element of good drafting. My question deals more with YOU explaining just how you “dance” between (emphasis added): “The prohibition of intermediate generalizations during prosecution is not absolute.” AND “Nothing wrong with it at all”. As I pointed out previously, and remind you here, the full gamut from top to bottom rung is easily derived with what passes as a passing phrase. Further, your most current reply assumes a condition that is neither present, not warranted to YOUR answering my question OF YOU. The ploy of “Don’t worry. You are by no means alone in the USA, in finding it difficult to distinguish between disclosed intermediate generalizations and those that are undisclosed in the application as filed.” appears to make the problem one of ME not understanding. That is called a dodge. That is NOT an answer to my question of YOU. Perhaps some substance of answer beyond “you need an educated appreciation of what I am not explaining” would better approximate an actual answer to MY question OF YOU. I “trust” that given your vaunted over 40 years, that you would know this well enough to GIVE an actual explanation (instead of a dodge of “you don’t know and thus this is a “you” problem). For another point, as should be clear in my posts here explaining to our various examiner contributors, I am well aware of “for which one needs a strict separation of the concepts of novelty and obviousness,” and for which, (as I have previously noted) the differences between the different approaches of the different sovereigns to obviousness and inventive step EACH – to properly apply – require a strict separation of the concepts. In fact, I would postulate that NO ONE who posts at Patently-O has done a better job than I of not only pointing out the need, but also pointing out the substantive separation of the concepts. So, given that your answer does not actually get to MY question of YOU, and that we can dispense with the non-answers that I have culled from your reply, perhaps one more try from you to provide a substantive answer. If, as according to you, this is as simple as you want to make it, then a meaningful explanation should not be that difficult. Sorry anon. Can’t fathom yours at 12:16 hrs. “One more try” therefore futile. I can only take then MaxDrei, that you do not understand even the “simple” proposition in that you (again) fail to be able to explain your position. Perhaps you should rethink how you describe that which you continue to be unable to explain. Your presentation (as is) makes you come across as an unwitting dolt, a dissembler, or both. If IPR’s really gave the patentee a meaningful chance to amend and essentially reopen prosecution, the need for a pending continuation would diminish. IPR claim substitution opportunity IS current increasing, but that will not significantly diminish the desire for application continuations. IPR substantive claim changes trigger intervening rights and loss of prior infringement recovery. Furthermore, as a practical matter, getting different claims in an ex parte continuation from a normal ex parte examiner is normally a lot easier than trying to do so being challenged by sharp litigation counsel and APJ attorneys [including on 112 grounds] in an inter partes IPR. Given that amendment practice to date has been nigh non-existent (especially in comparison to amendment practice during prosecution), I cannot see how the statement is anything but wishful thinking, as opposed to an objective (and verifiable ) observation. Common sense. Are you really suggesting that claim amendments are not easier in an ex parte continuation than in a inter partes IPR? Or are you so eager to try to criticize everyone else that you don’t even take time to read correctly? Common sense is neither common, not at times (such as here) necessarily something of sense. I AM suggesting that you pulled that notion out of thin air and want to make it seem like a given. The problem with that notion is that the opponent is not the examiner of a claim amendment in an IPR, now are they? (and can the “boo-hoo” that you are being “so quickly” picked on – grow a pair, and respond on point instead of the vapid and non-fitting ad hominem) ON this point, I did NOT miss anything that you wrote.